Monarch butterflies, one of nature’s amazing wonders, migrate from parts of Canada all the way to Mexico during their fall migration. The majestic monarch needs our help to survive. We can do two simple things—plant milkweed and flowers to attract butterflies and avoid using pesticides. 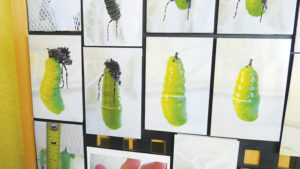 The article was accompanied by a photo of elementary school teacher Melissa Volpini examining a caterpillar. As an avid supporter of the monarchs, she delights in engaging her primary class at Little Current Public School to all aspects of monarch biology. Her students grew milkweed plants from seed in the classroom, some of which were used in their monarch way station at the end of the year. The class initiated and helped create a registered school butterfly garden and enjoyed the hands-on experience of raising monarch butterflies. As Ms Volpini stated, “The children were enthusiastic from the beginning of the process to the end. Our involvement became an amazing teaching tool to study the life cycle of the monarch as well as appreciate the wonders of nature.” With the supported research that monarchs will lay their eggs in urban gardens and balconies, all students are afforded the same opportunity to witness this miraculous phenomenon if teachers plant milkweed and flowers, either on the outside of their classroom’s window ledge or in a protected location on the school grounds. When a caterpillar is ready to become a butterfly, it finds a safe plant to climb upon. For at least a day it hangs upside down before the skin of the caterpillar starts to split along the back and a green chrysalis pushes the old skin away. The chrysalis twirls and whirls trying to attach itself to a sticky silk pad that holds it safely. 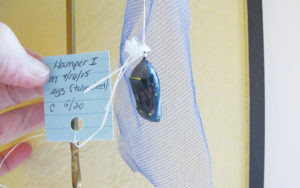 Finally, the chrysalis stops moving and hardens into a jewel-like jade chrysalis with gold trim and spots. For 10 to 14 days the monarch inside changes its form to become a beautiful butterfly that can be seen through the chrysalis shell before it emerges. Suddenly, the chrysalis starts to split down the front, and a monarch butterfly with small wings and a big abdomen drops out. Within minutes, the new butterfly pumps the liquid from its abdomen into the veins of its wings. Although the wings are fully formed, the butterfly must hold on until they are dry and strong before beating its wings to try them out. The butterfly also uncoils and coils its proboscis repeatedly in order to knit the two pieces into a solid straw-like tongue to sip flower nectar. When its wings have dried, it is ready to fly and begin its life as a monarch butterfly. 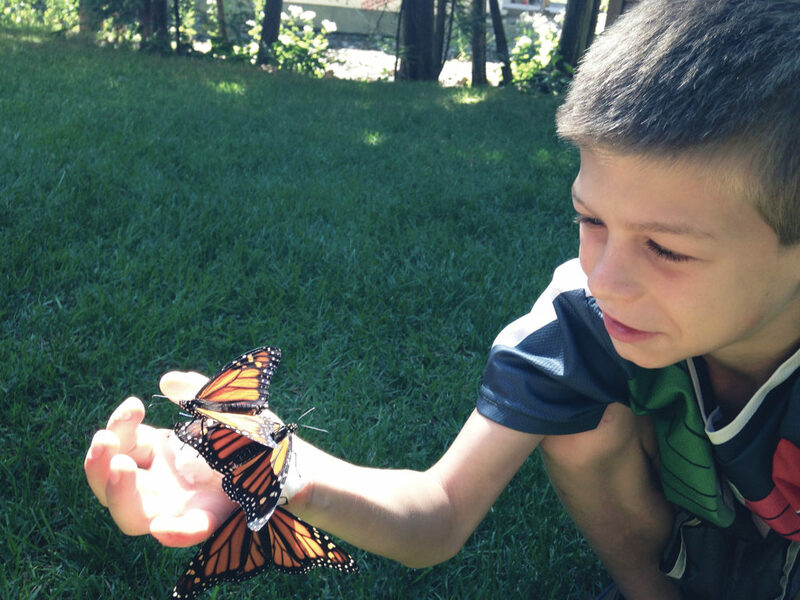 For an experience and thrill that children will never forget, invite butterflies into your schoolyard by checking out the Monarch Waystation Habitats’ registered butterfly gardens that provide resources necessary for monarchs to survive. Your garden should include milkweed as a place for monarchs to lay their eggs and for the caterpillars to eat. You should also plant specific types of nectar-producing regional flowers to attract the butterflies. 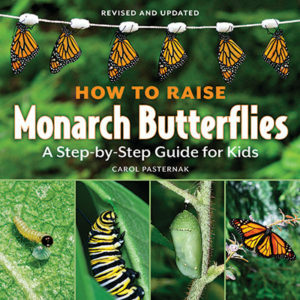 Obtain the illustrated book How To Raise Monarch Butterflies – A Step-by-Step Guide for Kids by Carol Pasternak, which demonstrates how to raise and release monarchs. Please remember that any plant that you buy for any insect is intended to be eaten by the insect. In this instance, milkweed and nectar plants must be grown to be safe for the caterpillar to eat. Many businesses sell milkweed and nectar plants for ornamental use only; in other words to add beauty to the garden. If you are planning to buy plants for use to draw any pollinator to your garden, always ask if the plants are free of any chemicals, including the organic pesticide known as Bt. These chemicals will actually kill the caterpillar that eats it. Find a nursery that sells pesticide-free milkweed plants for your garden. “I saw that familiar shadow—a glide and a flutter, so graceful to watch. That sweet shadow was a new Monarch butterfly searching for milkweed and nectar plants. I have a job to do—grow the milkweed and nectar plants in as healthy a way as possible so monarchs will find a waystation in my yard.” Nancee Caye, Monarch Wrangler, Gardener, & Citizen Scientist. Larraine writes children’s books on composting at www.castlecompost.com. The sixth book in the series will be Pee Wee Meets the Pollinators.